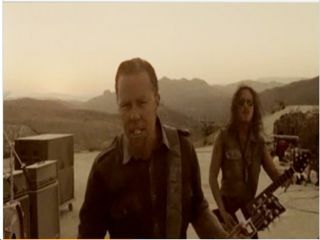 Metallica have debuted their video for new single The Day That Never Comes, via AOL.com. This is the first official video from the band's forthcoming album, Death Magnetic. In a return to old-style Metallica, it's an 8 minute epic. It mixes the four members of Metallica playing with scenes of soldiers at war. All are in a desert environment, in what is clearly portrayed as an Islamic state. It's a powerful video and a track that fans are already acclaiming as a major return to form. Read MusicRadar's exclusive review of Death Magnetic. The scenario of this video is interesting, though. Lead singer and guitarist James Hetfield has recently been vocal about Metallica's music being used in methods of torture in the notorious Guantanamo Bay detention camp. So, is there any intentional subtext to this video? You decide. Watch The Day That Never Comes video.